This tart is super simple to make, top with your favourite fruit for a moreish dessert. For the crumb case, melt the butter in a small saucepan. Place the biscuits in a food processor and process to fine crumbs (alternatively, place in a plastic bag and bash with a rolling pin, taking care not to split the bag). Mix the crumbs thoroughly with the melted butter and spoon into a 25cm/10in diameter loose-bottomed flan tin. Press the crumbs firmly over the base and up the sides of the tin to cover completely. Transfer to the fridge to chill until firm. For the filling, place the egg yolk into a bowl with the caster sugar and whisk together. Add the mascarpone and beat until thoroughly combined. Stir in the vanilla essence. In a separate bowl, beat the egg white with a clean whisk until stiff peaks form when the whisk is removed from the bowl. Gently fold the egg white into the mascarpone mixture. Remove the biscuit case from the fridge. Spoon the mascarpone mixture into the biscuit case and gently smooth the top with a spatula. 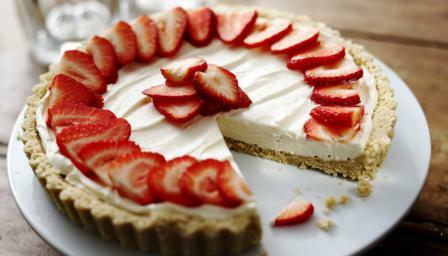 Arrange the sliced strawberries on top of the mascarpone. Transfer to the fridge and chill. Remove the tart from the fridge 20 minutes before serving.